As we returned to the campground, the clouds drifted away and the sun came out again. 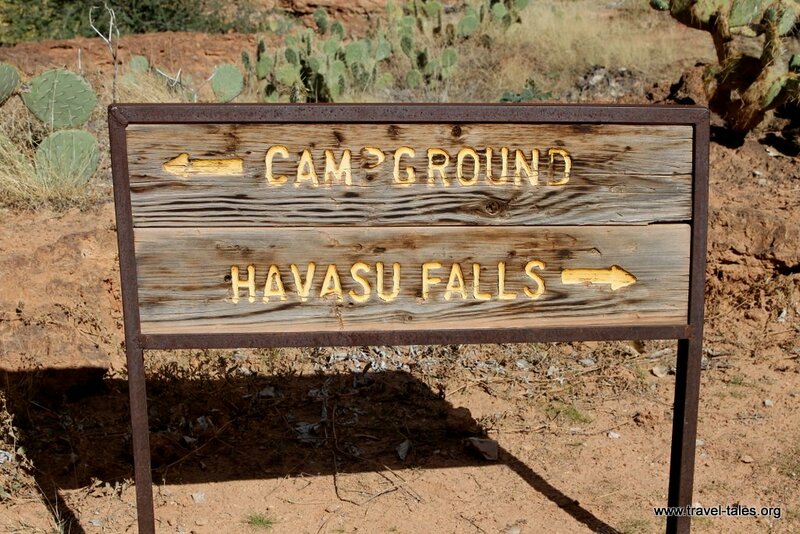 From the campground we took a walk up to Havasu Falls and explored it a bit more than we had the night before. After all, we’d only been hiking for about 4 miles that day rather than the 10 the day before! One of the fascinating things about the riverbed is that it is rough to the touch. Although it looks smooth, and with the level of water running over it you would expect it to be worn smooth over time, the super saturation of the water means that it leaves minerals behind as much as it polishes. As we were exploring around the falls, I was able to get some pictures which include Mandy. With her as an indication of scale, you can get a sense of quite how tall the falls are. Those beautiful photos bring back some good memories and a not so good memory of that backpack out of the canyon and the climb up that last steep hill. I’m glad we hired mules, so it was just day-packs on the way out!